As a result of colonial protests, in 1770, Parliament repealed the Townshend duties, except for the duty on tea. Parliament retained the duty on tea to maintain the principle that the British government had authority to tax the colonies. The colonists responded to the remaining duty on tea by boycotting English tea and drinking smuggled tea. By 1773, the British East India Company was in financial distress due in part to the colonial boycotts. In 1773, Parliament passed the Tea Act, which granted the British East India Tea Company a monopoly on the importation of tea into the colonies. The monopoly enabled the British East India Tea Company to sell tea at a lower price than smuggled tea, and at a lower price than it sold in England. Even though the Tea Act lowered the price of tea, colonists resented the act because it maintained the British position that Britain could tax the colonies without granting them representation in Parliament. The first ship carrying British East India tea arrived in Boston Harbor on November 27, 1773, but the Sons of Liberty and the Committee of Correspondence prevented the tea from being unloaded. Two more ships loaded with tea soon arrived and were prevented from being unloaded. After about two weeks the captains of the ships decided to leave Boston Harbor with their cargoes of tea. The Governor of Massachusetts, Thomas Hutchinson, was determined that British law would be obeyed, and refused to let the ships leave Boston without first paying the tea tax. On December 16, 1773, the stalemate reached a climax when a group of about 50 men disguised as Mohawk Indians, boarded the ships and threw the tea into Boston Harbor. 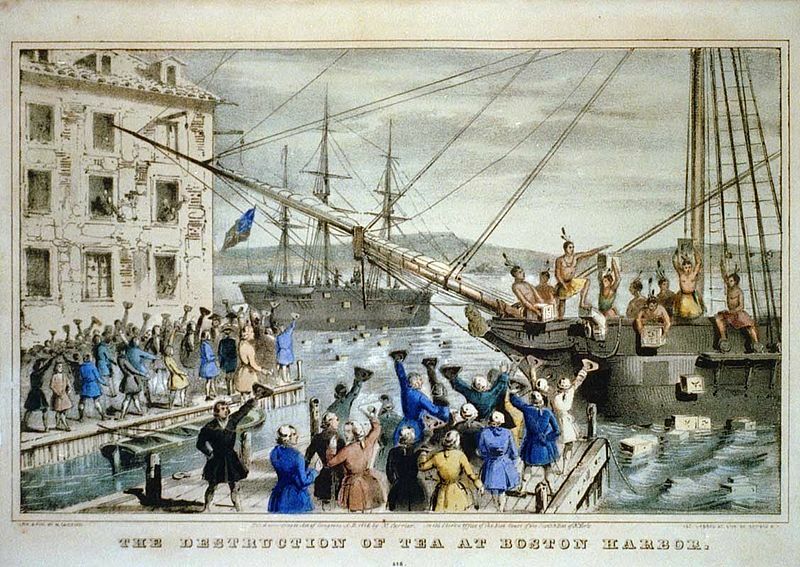 The British government responded to the Boston Tea Party by passing a series of regulations, known in America as the Intolerable Acts, that closed the port of Boston and transferred most of the governing authority for Massachusetts from the colonial government to the British government. Other port cities in America, outraged by the Intolerable Acts, staged their own tea parties, which resulted in even harsher legislation from Parliament.